Bring the sweet aroma of fresh-picked raspberries to your beverage service with this Bigelow Raspberry Royale tea! This tea's delicate raspberry notes make it a delicious tea to serve either hot or iced. Pour over ice, and offer this flavor as part of your refreshing summer drink menu. The robust black tea adds an energizing caffeine boost, while the hint of fruit flavor offers a pleasing infusion of flavors. This all-natural, bold brew has a bright honey color, distinctive aroma, and satisfying fruity finish. I keep returning to Bigelow's package, I try to avoid the big commercial brands, but I can't give up Bigelow. The flavor is rich and full. I can make a 2-cup pot, using 2 teabags, and add honey for a touch of sweet. Steep for five minutes, remove the teabags for a repeat performance later on in the day, and I'm a happy camper. The raspberry royal tea is great and has sweet, tart raspberry hint to the flavor. A great variation and perfect for our summer book club meetings. Slightly tart but wonderful with a little honey or other sweetener, makes great hot tea or even an individual iced brew. The fact that the bags are individually wrapped make it stay fresh too! I bought this a couple months ago. The flavor of raspberry is powerful one of the best teas for sure! Back to buy another box. The Bigelow Raspberry Royals Black Tea has a pleasant taste of Black tea coupled with a great fragrance strong smell of Raspberry. Overall, it exudes a great unique combination. It is a pretty good tea. it isn't harsh, and has a pleasant berry flavor that mixes well with the basic black tea half of the tea. it is well packaged and reasonably priced.. The Bigelow raspberry royale tea steeps much quicker than some other teas available. It provides a pleasant aroma infused with the raspberry, but the raspberry flavor itself is less present. The Bigelow raspberry royale tea is tart and sweet. The tea is great served chilled and is so refreshing. The tea is a perfect way to enjoy the summer heat. I had never ordered this twenty-eight pack of Bigelow Raspberry Royale tea before and I have become a huge fan of this delicious tea. The aroma will freshen any room with raspberry and I definitely taste the strong berry flavor. I would highly recommend. One of my favorite teas from Bigelow because it is drinkable without extra sweetener and tastes like desert! Very good price and always very good quality. I love all things raspberry. This is no exception. 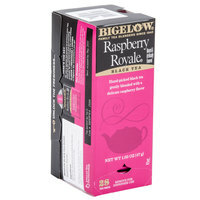 Bigelow Raspberry Royale Tea has full bodied intense raspberry flavor that I so love. Highly recommended. The Bigelow Raspberry Royals Tea has the perfect blend of tea and Raspberry. It steeps well and has a very pleasant aroma. It is great for spring but you will love it enough to drink it all year around. The raspberry flavor on this tea is second to none. This is an absolute myst have if you like a subtle yet incredibly tasty raspberry tea either hot or cold! This is a terrific tasting black tea that has hints of raspberry flavor to it. The tea bags are individually wrapped to keep the tea fresh. A nice and refreshing tea with a hint of raspberry flavor. This is a great spring time tea and our guests really enjoy the taste. This tea is so healthy with antioxidents and vitamins from the herbs and plants used and it tastes delicious! Its even a deep rose color when brewed and makes a delicious addition to yogurt and icecream for a fruity tart but still sweet topping! Raspberry is one of my favorite fruits and flavors and I love it in a black tea. A lot of herbal raspberry tea taste fake and not really like raspberry so it's nice to have this black tea with a great raspberry flavor. I'm usually not a big fan of fruity teas, but I like that this one has black tea in it too. It gives it a more hearty flavor. I love this fruit tea! Flavor or fresh raspberry in nice rich tasting tea will be appreciate by any fruit tea lover! Exceptional quality and great price! This flavored tea is made by Bigelow 28/box. It taste so good, your customers would love them. They are a bit pricey but worth the extra added flavors. It's so hard for me to find a raspberry tea that's to my liking. I think this one tastes great! Just the right amount of raspberry flavor. Like other bigelow tea products this is a great added flavor to the lovely classic black tea. It has a beautiful aroma and nice raspberry essence. Has a strong aroma, and a wonderful taste. Especially with a little honey added. It steeps well and gives a bold flavor. It is a great value for the price. While this is not the cheapest tea, the price is still really low for this premium tea. You get 28 bags per box for a reasonable price. This Bigelow tea in the raspberry flavor is fresh and wonderful. This Bigelow tea has a good raspberry flavor. It is very tasty as is. It is also good with additions such as lemon or orange flavorings. good tea and at a fraction of the price you would pay using local purveyors. I order dry items anytime im making large purchases that way I pay next to nothing for shipping. a very popular inexpensive tea we use at our coffee bar. Comes out very cheap per cup and our customers seem to enjoy the flavors. One of my favorite berries is the raspberry. I use this tea when I want something special. The flavor is truly raspberry and I love to put fresh berries in my iced tea. Put a little fresh mint in and you have a beautiful presentation and flavor with this wonderful tea. This tea is delicious. We put it out in a basket for catered event and its always the first to go. Great flavor and a reasonable price. It tastes a bit weak, but it has a good raspberry taste. I really like how it tastes. I am definitely getting more of these. Very fruity, fragrant black tea blended with raspberry flavors. Brews nicely and keeps well thanks to the foil based wrappers on each bag. Will buy more. This tea has a strong raspberry essence, so much that I use it to make a raspberry tea come summer time. Just make your normal ice tea but also add in a few of these to get a nice flavor going. We started using this tea at our company recently. People have really liked it so far. It is not bitter like some black teas can be. Subtle raspberry flavor. Nice blend. A very fragrant and flavorful raspberry tea. Excellent quality at a good price. It has become a household favorite that we will purchase again soon. This is my favorite tea to drink at home it really does taste like raspberry. Royale Raspberry is my go to tea with biscuit or scone it's great. As always, excellent product and service. We will continue to use Webstaurant. It is one of the easiest sites to order from that I use. We serve this in our bed and breakfast. It has become one of our favorites as well as our guests. Not overwhelming, has a great flavor. Great price on this tea, didnt pay any extra for shipping on my order and got these for less than we buy elsewhere. Good buy!